You have added Classy and Demure Black A-Line Dress into shopping cart. A dress that will stand the test of time describes this three quarter sleeve dress. 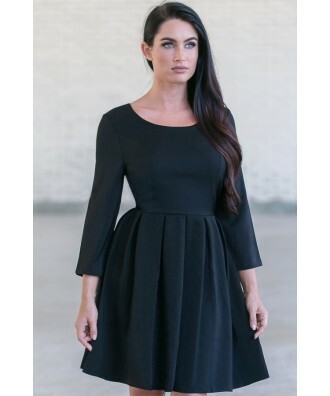 The Classy and Demure Black A-Line Dress is lightly lined at bust. It is made of a thicker polyester fabric. The dress is A-line cut, with a scoop neckline, three quarter sleeves, and a cut-out back. It also has cute button detailing on the sleeves. The back has a cut-out with a button closure. A hidden back zipper completes this dress. This dress will become a staple in your wardrobe due to its versatility. 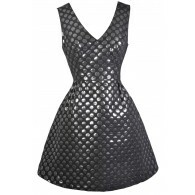 Pair this dress with a pearl necklace and heels for a classic look! Details: Lightly lined at bust. Hidden back zipper. 100% polyester. Hand wash cold. Tumble dry low. Cool iron if necessary. Small measurements: Length from top of shoulder to hemline: 34”. Bust: 34”. You have added Classy and Demure Black A-Line Dress into Wishlist. You have added Classy and Demure Black A-Line Dress for Stock Notification. You have set Classy and Demure Black A-Line Dress as a loved product. 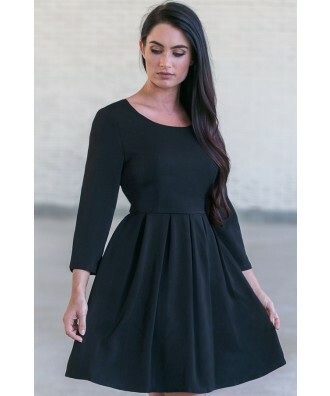 You have removed Classy and Demure Black A-Line Dress as a loved product.